St Damien was born in Tremelo (Belgium) the son of a corn merchant. After college, he became a Brother of the Congregation of the Sacred Heart of Jesus. One of his brothers also joined the congregation and two of his sisters became nuns. 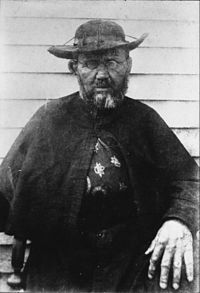 St Damien’s wish was to become a missionary and it was unexpectedly granted when he was allowed to take his brother’s place, who was ill, on a mission to Hawaii. Two months after his arrival on the island, he was ordained to the priesthood and from there, his lifetime of work as a missionary truly began. Hawaii was experiencing an influx of sailors and traders and, as we now know, with them they brought diseases which they passed to the local people. One of the diseases was leprosy. It was thought to be incurable and contagious, so the Hawaiian Government set up a distant community to have all suffers quarantined in the one place. During the following three years over 8,000 people were moved to the camp. St Damien volunteered to move to their community knowing it could be his death sentence. He set up churches and organised services and systems as well as tend to the sick and dying. Unfortunately, in 1884, St Damien contracted leprosy himself but it didn’t deter him from his work. Indeed, with greater fervour and help from a few others most notably St Marianne Cope, he responded as best possible to the community’s needs. At his funeral, the entire leper community followed his cortege to his burial place, underneath the tree where he slept on his first night in the community. St Damien, a martyr of charity, is the Patron Saint of Lepers and outcasts. His Feast Day is the 10th May. Pray for us that we will faithfully assist the poor and marginalised through our daily prayers and actions.